We just got whapped by another snowstorm. It was wet and heavy yesterday afternoon, and the Superintendent suddenly closed schools midday. Good thing that I'm home right now, because Steve worked in the city until 7:00. Nobody left his job because of the snow storm. Over night, we got about two feet of snow that stuck. Of course, schools are canceled, and the kids are home. Steve took the train into Manhattan, but he left an hour later than usual. So happy that he was able to shovel out the front steps and the driveway. 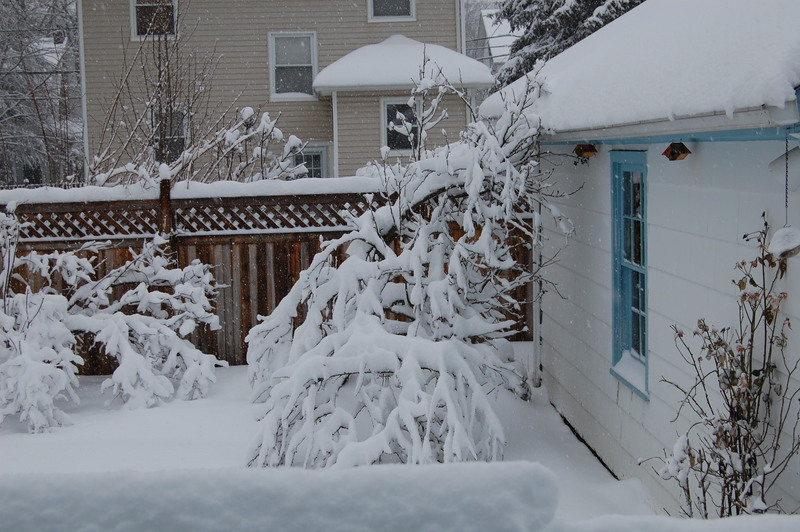 It's still snowing, and I'll probably have to do another inch or two, but that's cake. Suze told me the other day that the schools in Maryland have missed so much school that they're going to have to run classes into July to meet the state's minimum school day requirements. However, the state also has laws regarding holding classes in the heat, since most schools don't have air conditioning. The state's superintendents are trying to get the state legislature to change the minimum day law. Those poor kids are going to have a lost year. My kids are out of their minds with excitement. They have to wait until 10:30, when I finish my chores, before they go out. I like to go out with them at first. They're quietly drawing right now, but it took a while to settle them down. I tried showing Jonah this great article on the Nasca lines in Peru to distract him from the snow. I was an anthropology major in college. That was after computer science and before creative writing and way before political science. (Here's how I settled on political science.) Back when I was the anthropology major, Maria Reiche was a big hero. And the point of this long winded post is that my boys are antsy to play in the snow and I'm on a hundred percent parent duty right now. I'll come back to the computer later in the afternoon, after they're tired and their cheeks are raw and I let them play computer games. The state’s superintendents are trying to get the state legislature to change the minimum day law. They are doing that here also. We started out on bad footing, having closed the schools for two days because of the G-20. At least we are only on the edge of this storm. Today is only a two-hour delay. I probably shouldn’t post this, but we have absolutely no snow. Just lots and lots of rain. I just hope that whatever is happening doesn’t affect our flight to SF) tomorrow! Golden Gate, here I come! Actually, in Maryland, they just ruled that schools don’t have to comply with the 180 day rule so schools where I live in Montgomery County will be closing at the regularly scheduled day. I, for one, was looking forward to school being extended b/c that meant I didn’t have to pay for camp for a week where we are going on vacation in the middle of it. Sigh. Yeah, Suze was a little off-base– most MD schools had snow days built in and would only have had to go a few days over, which would be mid-June still, not July, and the state superintendent has already ruled that, partially due to the state of emergency declared on several of those days, the systems have a waiver for this year. No lost year here in MD :). our county in md missed 9 days. we will make up 4 (already scheduled make up days) and have been “forgiven” 5 by the state. who knows, though, whether we will have any more snow days before it is all over. Sometimes a snow day is the best thing the school can give kids.